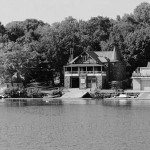 Philadelphia’s Boathouse Row, photographed here in the latter half of the twentieth century, is one of the first sights visitors to Philadelphia see when they enter the city from the west. The structures that make up this architectural landmark represent Philadelphia’s special fusion of sport and history. On the banks of the Schuylkill, from north to south, the boathouses include the Sedgeley Club, the Philadelphia Girls’ Club, Undine Barge Club, Penn Athletic Club Rowing Association, the College Boat Club of the University of Pennsylvania, Vesper Boat Club, Malta Boat Club, the University Barge Club, Bachelors Barge Club, Crescent Boat Club, the Pennsylvania Barge Club, and the Fairmount Rowing Association. A varying number of rowing organizations have used the boathouses since their origins; by the early twenty-first century the boathouses were shared by a variety of private clubs and local university teams, including the University of Pennsylvania, Drexel University, and La Salle. The earliest rowing clubs, established in the 1830s, have not survived. However, between 1853 and 1856, Undine, University, and Bachelors’ Barge Clubs were all founded and remained in operation in the twenty-first century. Late nineteenth-century Philadelphia artist Thomas Eakins (1844-1916) was fascinated with rowing and painted many scenes of rowers on the Schuylkill River. This 1880 wood engraving created for publication in Scribner’s magazine reproduces Eakins’s The Biglin Brothers Turning the Stake (1870), which includes boathouses of that era faintly visible in the background. Eakins depicts the Biglin brothers, John and Bernard, who were well-known professional rowers from New York in the decade following the Civil War. 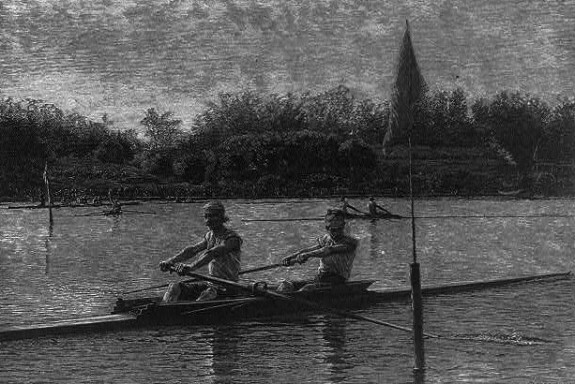 In the painting, Eakins captured the midway turn around point of a five-mile race, which the brothers won by one minute. To the sound of cheers from the shore, the brothers were crowned world rowing champions. 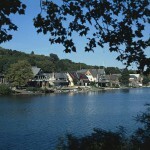 In European folklore the undine is a water nymph, and appropriately lends its name to one of Philadelphia’s famous Boating Clubs. The stone façade and castle-like turrets of the Undine Barge Club Boathouse make number thirteen on Boathouse Row stand out among its neighbors. Founded in 1856, the first clubhouse was small, but renovations in the 1880s expanded the structure and the Fairmount Park Commission’s standards required the building be made of stone. The Undine Barge Club is considered a founder of the Schuylkill Navy, which was formed in 1858. The club has many successful alumni, including Olympic Silver Medalist Tim Young and many members of the U.S. National Team. 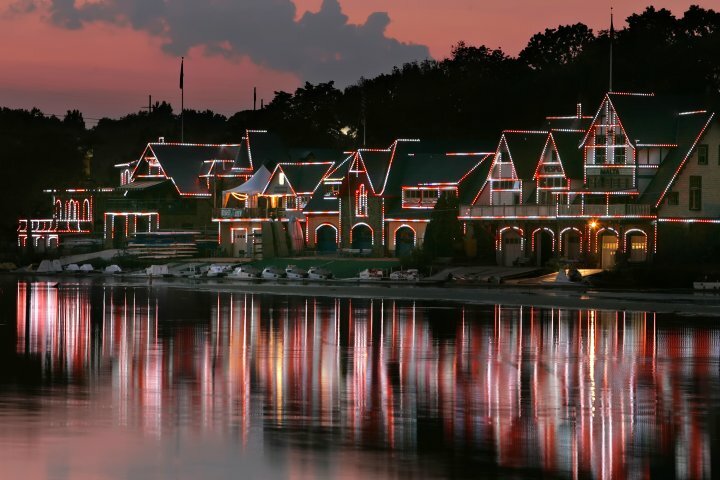 Philadelphia’s Boathouse Row is a National Historic Landmark that reflects the city’s fusion of sport, culture, and history. 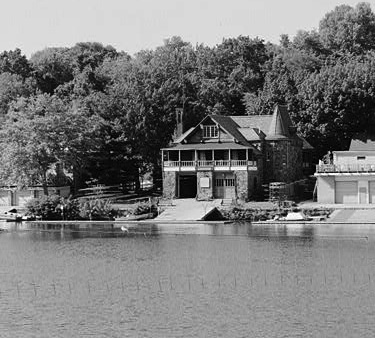 The boathouses, built in the second half of the nineteenth-century, line the eastern bank of the Schuylkill River just north of the Fairmount Waterworks. Lit at night with thousands of glowing bulbs, they form a welcoming beacon to travelers entering Philadelphia along the Schuylkill River on Interstate 76. The circumstances that led to the distinctive row of boathouses on the Schuylkill date to the early nineteenth century when Philadelphia, a commercial and cultural center of the early American Republic, became one of most historically rich and lively rowing cities in the United States. In 1821, the construction of the Fairmount Waterworks’ dam created favorable conditions for rowing on the Schuylkill and set an aesthetic that helped determine the style of the earliest boathouses. Temporary boathouse structures probably existed as the popularity of rowing grew, but construction of more permanent boathouses began in the 1850s under the auspices of the Schuylkill Navy of Philadelphia and later with increasing involvement from the Fairmount Park Commission (formed in 1867). The Schuylkill Navy, founded in 1858, served as a membership organization for the city’s amateur rowing clubs and oversaw activity on the river. Surviving into the twenty-first century, it became one of the nation’s oldest amateur sports associations. The first small boathouse built by the Undine Barge Club was little more than a shack, but the original structure was renovated in the 1880s by the prominent architectural firm of Furness & Evans. The boathouse architecture of from the 1870s onward reflected the impulse of the Fairmount Park Commission to impose order on the riverfront landscape by requiring stone construction. When additional boathouses were built in the 1890s and early twentieth century, architectural design aesthetics had changed, and architects incorporated brick and other materials in their designs. However, each structure still reflected the utilitarian goals of protecting and storing rowing shells as well as providing a gathering place for participants. The Schuylkill’s boating history was captured on canvas by the well-known late-nineteenth-century American painter Thomas Eakins (1844-1916). 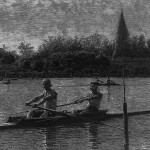 A rower himself, Eakins found inspiration in the bodies of oarsmen as they glided along the river near the boathouses. Unfortunately, rowing’s popularity declined in the first half of the twentieth century as membership in rowing clubs dropped during the two world wars and the Great Depression; by the second half of the twentieth century many of the boathouses fell into disrepair. To celebrate the Bicentennial in 1976 and revive the boathouses, lights were hung outlining the frames of each structure, and after several repairs, in 2005 the lights were replaced with LEDs. A recent addition, Lloyd Hall, built in 1999, is the only public structure among the boathouses. After demolition of the former public boathouse, Plaisted Hall, the new construction created controversy because its many amenities did not include room for storing or launching rowing shells. In 2002, St. Joseph’s University and St. Joseph’s Prep built a boathouse upriver, near the Strawberry Mansion bridge, but this modern structure along with the now condemned East Park Canoe House, the former home to Temple University’s team, are not traditionally considered part of Boathouse Row. Temple University also proposed construction of a new, multimillion-dollar boathouse but withdrew its proposal in 2013 because an Open Lands Protection ordinance enacted in 2011 required such projects to be offset by the purchase or transfer of comparable park land. Despite these controversies, the twenty-first-century Boathouse Row serves as a landmark and gathering place for athletes from around the country, from novices to Olympic-caliber rowers. Many of the associations that built the first boathouses survive and continue to support thriving club programs while also serving as venues for high school and collegiate rowers. One of the most celebrated races every spring, the Dad Vail Regatta, welcomes oarsmen and women from collegiate programs and features a novice race for corporate sponsors, a fund-raising tool that fuses Philadelphia’s rich history of rowing with its future. Brenna O’Rourke Holland earned her Ph.D. in history at Temple University. Her dissertation, “Free Market Family: Gender, Capitalism, and the Life of Stephen Girard,” is a cultural biography of Philadelphia merchant-turned-banker Stephen Girard that interrogates the transition to capitalism in the early American Republic. As an undergraduate at Colgate University, she was a coxswain for the Men’s Varsity Rowing team, and she enjoys cheering on her alma mater at races along the Schuylkill. 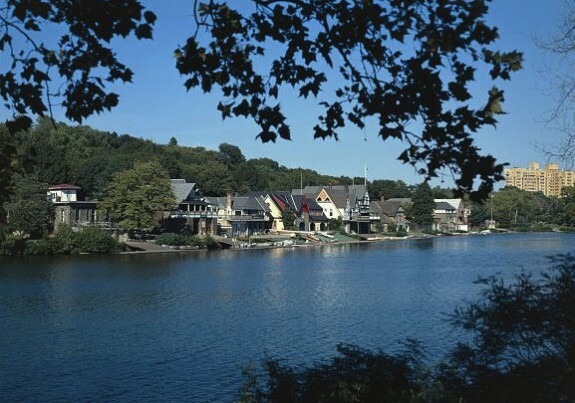 Beischer, Thomas G. “Control and Competition: The Architecture of Boathouse Row,” Pennsylvania Magazine of History and Biography 130 (July 2006): 299-329. Heiland, Louis. The Schuylkill Navy of Philadelphia. Philadelphia: The Drake Press, 1938. Mendenhall, Thomas C. A Short History of American Rowing. Boston: Charles River Books, 1980. Historical Society of Pennsylvania, 1300 Locust Street, Philadelphia. Special Collections Research Center of Temple University Libraries, Samuel L. Paley Library, 1210 Polett Walk, Philadelphia. 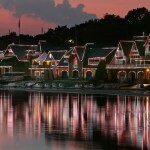 Boathouse Row, #2-15 Kelly Drive, Philadelphia. Independence Seaport Museum also holds historical materials relating to the Schuylkill Navy of Philadelphia, and the many rowing clubs as well. For more information, please contact library@phillyseaport.org or 215-413-8640.